[ James John Hornby, Headmaster of Eton College. ] Autograph Letter Signed ('J. J. Hornby') to Sir Richard Harington regarding the portrait just done of him [ by John Collier ]. On letterhead of The Lodge, Eton College. 10 December 1897. 2pp., 12mo. Bifolium with mourning border. In good condition, lightly aged. The letter concerns a portrait of Hornby described in Lionel Cust's 'Eton College Portraits' (1909, dedicated to Hornby's memory), as being '56 x 45 inches. Painted by the Hon. John COLLIER, 1897. […] Seated figure to the knees, facing the spectator; in black gown and D.D. Hood. | Presented to the College by Old Etonians. (Provost’s Dining Room.)' 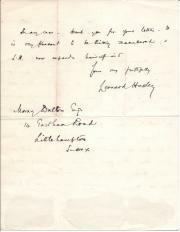 Responding to Harington's congratulations, Hornby writes that it is 'a great pleasure to have such kind words from an old friend'. [Two printed works bound together.] Hamilton's 'An Inquiry into the Genuineness of the Manuscript Corrections in Mr. J. Payne Collier's Annotated Shakspere' and 'Mr. J. Payne Collier's reply to Mr. N. E. S. Hamilton's "Inquiry"'. Hamilton: London: Richard Bentley, New Burlington Street, Publisher in Ordinary to Her Majesty. 1860. Payne Collier: London: Bell and Daldy, 186 Fleet Street. 1860. Both works first editions, and both in good condition, on aged paper. Bound together in late nineteenth-century red cloth half-binding, with marbled boards. Title on spine: 'COLLIER CONTROVERSY | H.R.H. | 1919'. Hamilton title in full: 'An Inquiry into the Genuineness of the Manuscript Corrections in Mr. J. Payne Collier's Annotated Shakspere, Folio, 1632; and of certain Shaksperian Documents likewise published by Mr. Collier'. + 155pp., 4to. With frontispiece and two plates, one of them double-page. Collier title in full: 'Mr. 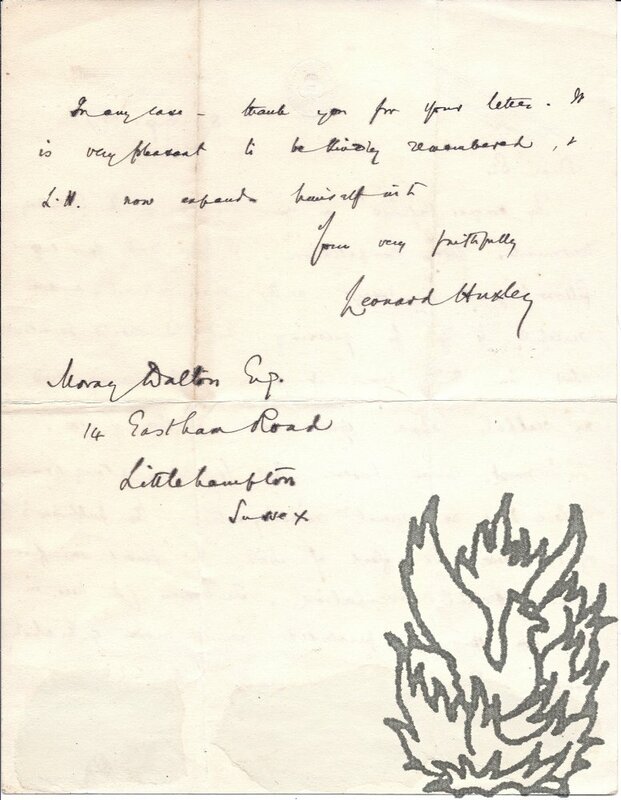 J. Payne Collier's reply to Mr. N. E. S.
Autograph Letter Signed from the editor of the Cornhill Magazine Leonard Huxley to the novelist 'Moray Dalton' [Katherine Mary Dalton Renoir]. 8 August 1917; on letterhead of the Cornhill Magazine, 50A Albemarle Street, London. 4to, 2 pp. Sixteen lines. Text clear and complete. Good, on lightly-aged paper. He congratulates her on her 'success in the Saturday Westminster Essay Competition'. He is grateful to her for 'guessing that I should be interested in this work of yours after having plied my scalpel upon your novel "The Sword of Love".' He regrets that 'for many a long year' he has 'done no general reviewing outside the publisher's office. There the flood of MSS. that poured in furnished effectual occupation. The fairies of "A midsummer night's dream:" a lecture, delivered before the "Loughborough Literary and Philosophical Society," November 9th, 1858. Printed for private circulation."; . 28 pages, 8vo. 14 leaves, the last a blank. Paginated [1-3] 4-26 [1-2]. Unbound and stitched as issued. In very good condition though grubby and with one dogeared corner. Brief mention (p.7) of John Payne Collier's discovery of 'The life of Robin Goodfellow' in the library of the Earl of Ellesmere, and of 'Mr. Halliwell'. No copy in the British Library.